On September 18, we teamed up with our partners at Friends of the Chicago River to celebrate World Water Monitoring Day in Chicago, IL. Each year, World Water Monitoring Day provides an opportunity for communities around the world to raise awareness of the important role that citizens play monitoring and taking action to protect local water resources. This year, our founder, Philippe Cousteau Jr. and our team joined Friends of the Chicago River in Chicago’s Clark Park to co-host our official World Water Monitoring Day event, which united over 300 Chicago Public School students from Lane Tech High School and Chicago City Day School, along with students from Northeastern Illinois University, providing them with an opportunity to learn about the Chicago River watershed through hands on activities. 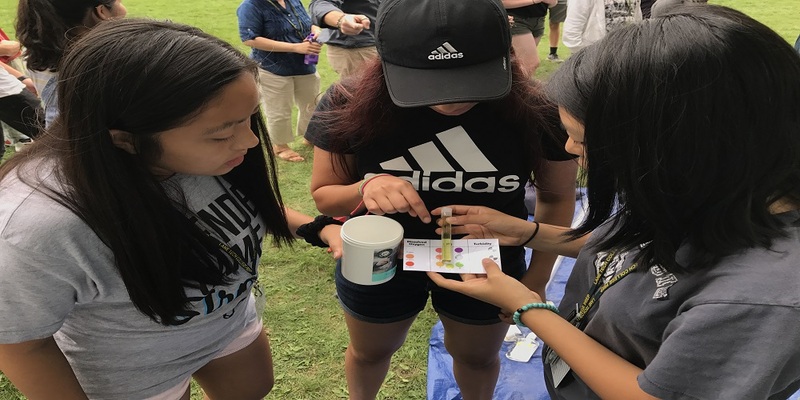 Participants worked to monitor water quality from a local section of the Chicago River as part of the EarthEcho Water Challenge, and took part in activities, led by their peers, focused on aquatic life, macroinvertebrates, and native plant life. Attendees also carried out a river cleanup to help directly improve the health of local waterways. Volunteers from EarthEcho Water Challenge program sponsor, Xylem Watermark, joined the event to help lead students through the water monitoring process. Together, EarthEcho Water Challenge participants, partner, and Water Challenge Ambassadors hosted events worldwide to celebrate World Water Monitoring Day and engaged their communities in monitoring local water quality. We are grateful for the work of all program participants to help #MonitorWater and protect their local watersheds.